Life can take on many designs. As a licensed architect turned mother of twin two-year olds, my daily schedule went from punch lists and bid sheets to Legos and wooden block structures. My involvement in the Lincoln community started in 2000 when we moved from Racine, Wisconsin. The main reason for our move was so that our children could attend a strong public school system and we wouldn’t have to drive them miles upon miles to the nearest private school. Essentially, this move also was a retirement of sorts for me. I was a licensed architect so when we moved here, I taught for a year in the University of Nebraska-Lincoln Department of Architecture as an Adjunct Professor. During that time I discovered I wasn’t quite ready for college-aged personalities and I missed building blocks at home with the twins. But I also met Barb Hoppe (Bright Lights Founder) and sat in on an organizational team to construct a middle school Bright Lights Architecture Day Camp. I immediately loved the energy of the Bright Lights staff and team of teachers, and was happy to provide some educational input from teaching beginning architecture students. I went on to volunteer at many Lincoln organizations: First Plymouth Preschool where my twins attended, the Nature Center Preschool they attended later, and finally Sheridan, Irving and Southeast schools. As they got older and started driving and needing me less, I found I had more to give to others and started volunteering at TeamMates as well. One day when I was walking into Irving to meet my Teammate, I ran in to Barb Hoppe again. She mentioned her interest in bringing an elementary aged architecture class to the program. At the time, I was President of the Friends of the Lincoln Children’s Museum and I was acutely aware of their new exhibit of structures made out of KEVA blocks. The twins had hundreds of these at home and I mentioned to Barb that there could be a way to use the blocks in an architecture/building focused class, and the class Awesome Architecture began! Putting together lesson plans for elementary kids interested in architecture was revisiting activities my kids had done for years at home. It was a dream for me to apply my academic knowledge for others to enjoy in a classroom setting. Teaching Bright Lights sparked a joy inside of me I had not recognized before. I enjoyed being a mom of young twins; hanging out and building with my kids. But teaching at Bright Lights allowed me to realize that I love to do that with any child…not just my own!! Awesome Architecture had been offered for three years when a teacher asked someone for assistance mending clothing. I eagerly offered and defended that sewing, for me, is a forgiving architecture. I have been sewing since I was 7 and had taught my daughter the freedom that creating with fabric and thread can bring. That discussion lead to an opportunity to offer a Bright Lights sewing class to students, in addition to Awesome Architecture. My excitement and energy exploded as I thought about how to teach a dozen or more young students to sew on their own! 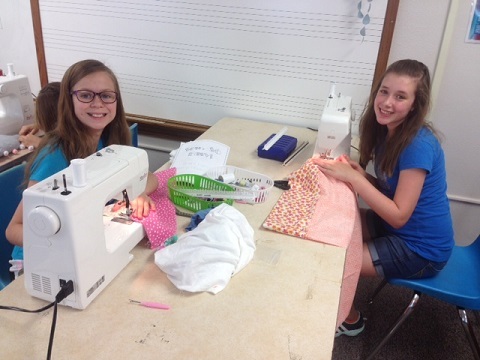 This year, having taught sewing for a few years and always over-filling the class, I teamed up with a wonderful teacher to offer a decorate-your-own-room class called Room Décor. Excitement building again, I realized the evolution that Bright Lights has offered me as I continue to teach, wanting to give more. Most importantly, however, the evolution to offer children in our community wonderful, creative, ever-changing curriculum for summer exploration is the great commodity. How could I not want to be a part of this?! Editor’s Note: Nancy is a great example of how a community member can become a teacher at Bright Lights and share their passion with students. If you’re interested in doing the same, please contact us at teacherrecruit@brightlights.org. 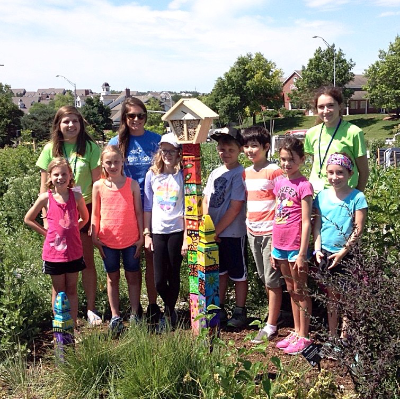 Bright Lights provides hands-on student learning opportunities in the summer. Students explore their interests in a fun way that is challenging and inspiring. The classes cover a broad range of curriculum for completed grades kindergarten through eighth, offering something of interest for all students.